I love folk music; ergo I love folk music festivals. Nothing sings summer like lounging on a lawn and taking in fabulous music. For years, the Calgary Folk Music Festival was my late July summer staple. It’s a unique musical event that wonderfully stretches the term “folk” (where do you get to hear Yiddish hip-hop, Corb Lund and the Hurtin’ Albertans, Michael Franti, The Avett Brothers, Bruce Cockburn and the Decemberists together). Four days and nights of great music, people watching, and just plain fun – which is why I’m going to miss it so much. But here’s my great consolation – I’m part of a church that puts on a Folk Festival! How fabulous is that? 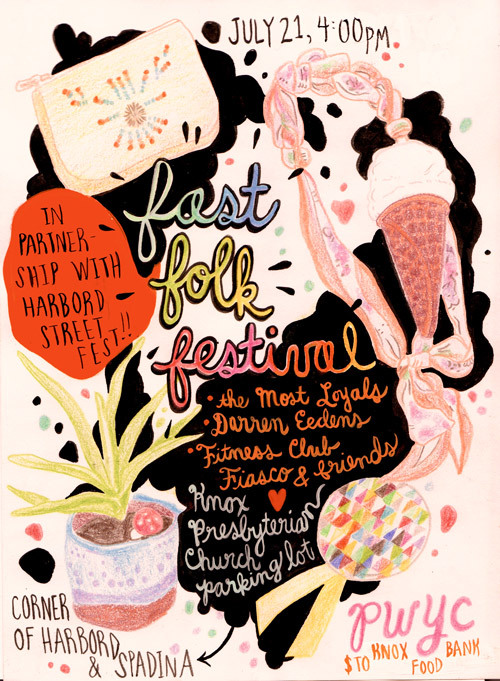 As part of the Harbord Street Festival in Toronto, Knox Presbyterian hosts the Fast Folk Festival (fast, as in, brief, of short duration, or “wow, that went by way too fast”). And I can’t wait to get my inner folkie on and hang out for the afternoon. If you’re in Toronto, it’s happening next Saturday, July 21, starting at 4:00 p.m. I caught an early preview of one of the bands headlining our Fast Folk Festival, The Most Loyals (check out their website and some photos). Loved their music and so glad Sarah and Andrew are part of the Knox community. And for everyone in Calgary, keep an eye out for The Most Loyals because you’ll be enjoying this group on stage at the Calgary Folk Festival one day real soon. This entry was posted on July 15, 2012, 9:00 am and is filed under Church, Great music. You can follow any responses to this entry through RSS 2.0. You can leave a response, or trackback from your own site.